Filmmaker Roger Gastman invited me to the screening of his and Joseph Pattisall’s documentary ‘The Legend of “Cool” Disco Dan’ at AFI Silver Theatre. 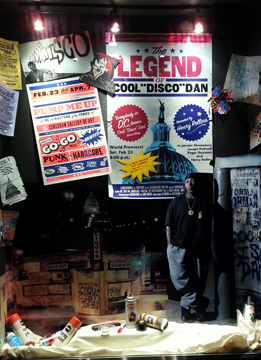 The story focuses on the peak era of Cool “Disco” Dan in DC, which included riots, neighborhood crews, and the crack epidemic that made DC the murder capital at the time. Dan is a large part of the documentary, but there are many other engaging characters who come into play. Roger and Joseph had been working on the documentary for many years and did a great job with the transitions, pace, music selection and main story line woven with sub stories. The only downside is the film’s appeal to a limited audience due to it’s DC-specific focus.